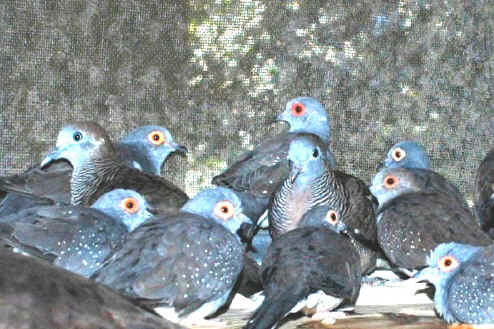 This page includes ideas that we have come up with on how to successfully care for diamond doves. The information presented here is based largely own our own experience and the experience of some of those who have written to use since we started this web site For additional information I strongly recommend reading Dr. Matthew Vriend's book listed at the end of this page. In my opinion, if you asked the diamonds what kind of housing they would prefer to have inside someone's home, I believe they would opt for a wooden enclosure about the size of cube two feet on each side. It would be enclosed on the top, bottom and three sides, and the front side would have a screen and drop down door that would serve as a front porch and landing pad when open and it would have would have built light fixtures, one for day, and a very small one for night. But most of us would rather go with a cage that would allow us to view our birds from all sides. Many people write in asking for a specific recommendation for a cage for their diamonds. The best cage is the largest cage you can afford and that you have space for in your home. Some people have written in and say they have devoted an entire room for their doves. Even if you do that you still may want to have a minimum cage that the doves can call home and where they can go to roost at night. The cage can also be the location of the food, grit, water, cuttlebone, and perhaps a nest. In my opinion a wire cage should have the bars spaced no further apart than 1/2 of an inch. I have one cage with bars spaced at one inch and once baby doves fledge they can enter and leave the cage through the cage walls if they choose to. I prefer a cage with a drop down door, so that the doves can use the door as a landing pad when they return to the cage or a takeoff platform when they leave the cage. I prefer a flat topped cage so the cages can be stacked when necessary. And I prefer a light colored cage because I think it looks more attractive than a dark colored cage in most people's homes. And recently I have found some cages where the entire front of the cage can be opened for cleaning purposes. 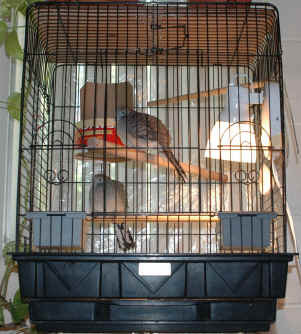 There is a photo of such a cage on the ringneck dove page. Below is a photo of what I consider to be the minimum cage for a pair of diamond doves. It has the dimensions of 13 inches across the front, 15 inches on the side, and 17 inches in height. It has a solid plastic base which I feel is better than sheet metal because there are no folds in the metal which can not be cleaned and plastic is less likely to scratch furniture. It has a flat top which is important as sooner or later you probably will have more than one cage and they can be stacked if space is a problem. Cages of this size are also easier to transport in motor vehicles. 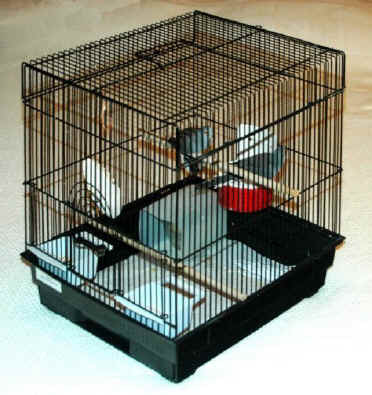 The cage has two perches but both perches are the same size. The perches in a bird cage should be of different sizes to avoid crampy, sore feet. (3) Two things I would prefer to have for a diamond dove cage is a drop down door for reasons mentioned above and a white color as I feel white cages appear nicer inside one's home than black ones. In my opinion if you are going to use a cage of this size then you should plan on allowing your doves free flight time several times a week so they can get the necessary exercise. See the section labeled "Free Flight Time" on this page. If you do not feel comfortable with allowing free flight time then I would suggest that you provide your doves with a much larger cage. Attached to the front wall of this cage are two containers - one is used for seed and the other is used for grit. Note that the bottom grate has been removed and that soft paper towels are placed on the cage floor. Grates are not recommended for doves as they are ground birds and thus often walk or sit on the cage floor. We use paper towel instead of newspaper as newspaper has a dehydrating effect on the birds feet. In the rear left corner is a glass water dish covered by a contamination shield which prevents droppings from falling in the water. In the right hand corner is some extra nesting material the the birds can use to improve their nest. A cuttlebone is located on the left cage wall which is positioned so the birds can reach it from one of the perches. There are two wooden perches in the cage located at different levels. A nest box is attached to the rear cage wall in a position that has the actual box below the height of the highest perch. Additional information about water contamination shields, nest boxes, and nesting material is included below. I recommend using glass water containers instead of plastic cups. 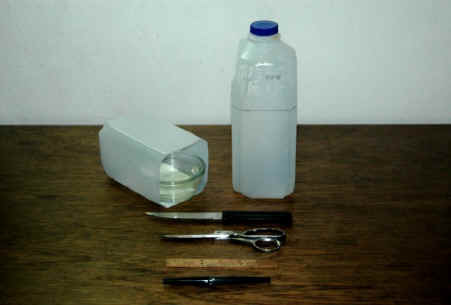 Crystal containers do not contaminate the water as plastic containers to particularly when water is left in it for a day or two at room temperatures. Mineral deposits formed when water evaporates also can be cleaned easier from the hard surface of glass than the porous surface of plastic. One of the biggest problems providing water for birds is the fact that the birds are very good about finding ways to leave their droppings and other trash in the water. I now recommend the use of the contamination shield shown below. Since I have started using these shields, I have removed 99 percent of the contamination problem and now my birds always have clean water to drink. However if I do leave the water in place too long, the birds will carry feathers and other trash into the shield and dump it in the water bowl. There are some commercial shields available but I have had problems using that in the past as some birds have gotten trapped inside the shield and could not get out. After using the shields shown below for six months there has never been one case of entrapment. However, once you start to use these shields I recommend you watch your birds carefully for a while to see if any problems develop. To construct the water contamination shield follow the steps below. 1. Obtain an empty one half gallon plastic container used for milk or fruit juices and wash it thoroughly. 2. 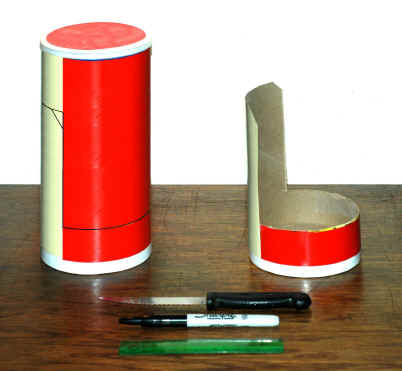 Use a felt tip pen and a ruler to mark a line 6 inches from the bottom of the container as shown in the photograph. 3. Use the serrated kitchen knife or scissors to carefully cut along the marked line. If you make a ragged cut you will not be happy with the container's appearance later! 4. Remove the label from the container or place the container in the cage with the label down. Place the glass water container in the container and push it all the way to the back of the container so that maximum shielding is obtained. WARNING (January 2005): A few days ago I came home and found a medium sized dove inside the contamination shield in the water dish. The dove was unable to back out so essentially was stuck in the water. Most of the water had been displaced by the birds body so what remained was warmed by the birds body heat and no harm was done. This was a first. So far there have never been difficulty with the smaller doves such as diamonds. For a medium sized dove the answer may be to have both ends of the shield open as this would allow a dove that got itself into the water dish to climb out. If you have a pair or one or more females you should provide a nest and nesting material for your birds even if you do not plan on raising babies. If you do not want babies, the eggs can be removed after the second one is laid and replaced with wooden or plastic eggs so the birds can "incubate" them for the normal 14 day incubation period. This keeps females from laying new eggs every few days and ending up with low calcium levels, egg binding, fragile bones, and possible fractures. One method is to use a small wicker basket and attach it to the side of the cage with string, wire, or "twisties" as is pictured at the top of the page in Dr. Van Hoozier's photograph. She uses clean, washed pine straw as a natural nesting material. The wicker basket should be bowl shaped so the eggs tend to stay in the center of the nest, thus making it easier for the birds to cover the eggs during incubation. There are other commercial nests that one can buy in pet stores or it is possible to simply make a open box about one and a half inches deep and three and a half to four inches wide from a piece of cardboard. We now use a round 42 oz oatmeal box that has a five inch diameter and a 16 inch circumference. To make a nest box we make a circumference cut two inches from the bottom of the box except for 5 inches of the circumference. Here we make two vertical cuts to the top of the container which leaves a backboard that prevents birds from pushing their tales through the cage bars and also provides a place to attach the finished nest box to the cage wall. This backboard can be cut off at height that will allow easy placement in your cage. If a backboard of 5 inches in width is not sufficient to keep you birds from pushing their tails through the cage bars then you might consider increasing the width to 6 inches or more. The photos below illustrate the method we use to construct the nest box. 1. First take a felt tip pen and a ruler and mark a ring on the container two to two and a half inches from the bottom of the container. Mark off five inches on this ring to be the width of the backboard. At the beginning and end of the five inches on the circumference ring draw two vertical lines five inches long. Draw a line to connect the top ends of the vertical lines. 2. Using a serrated kitchen knife like the one shown, cut the top of the backboard along the 5 inch horizontal line. Then cut the two vertical lines being careful not to extend the cut below the bottom circumference ring. Finally cut the bottom circumference ring being careful not to cut into the backboard. Scissors can be used to trim any ragged edges. 3. Take a roll of one inch masking tape and cut off an 11 inch strip. Starting at the edge of the backboard, apply the tape by pressing half the width to the outside of the nest box and then folding the other half to the inside of the box. Repeat this three more times to build up a thickness that provides padding for the birds' feet when they stand on the edge of the nest box. 4. Then take s sheet of soft paper towel and fold it into quarters. Fold each corner in so the towel now has an octagonal or almost round shape. 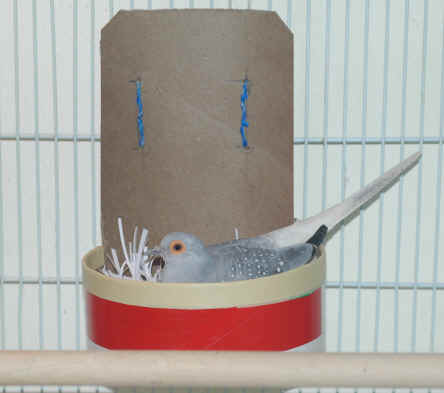 Form the paper towel into a bowl and fit it into the nest box. The bowl shape will help keep the eggs in the center of the nest making incubation easier for the birds. 5. To provide nesting material, take two 3 x 5 inch file cards, fold them in half as shown in the photo, and then with sharp scissors cut off the ends of the cards into 1/16th of an inch strips for nest material. It takes about one minute and a half to cut the strips from two card. Some nest material should be placed in the nest box and some should be left on the floor of the cage so the birds are encouraged to finish constructing the nest themselves. Be sure to remove the grate from the cage if there is one less the nesting material will fall through the grate and the doves will not be able to reach it. 6. To provide a means to fasten the nest box securely to the cage wall make four holes in the backboard spaced as shown in the photo. Then take four "twisties" and twist them together to make two long "twisties". Place them in the holes in the backboard as shown. 7. 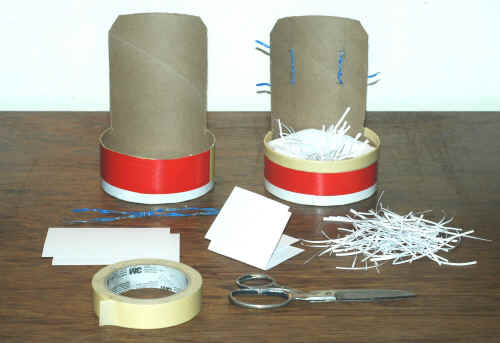 Use the "twisties" to attach the nest box to the rear wall of the cage. At least one horizontal bar is needed to keep the nest box at the proper height. The "twisties" can be wound around the vertical bars (if any) to provide a secure attachment. The nest box should be located so the top of the box is a little below the highest perch. This will keep the doves from using the box as a place to perch. Also locate the nearest perch far enough away from the nest box so the bird's stools does not fall into the box. 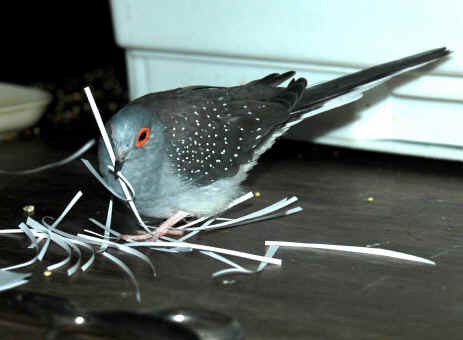 Diamond doves can be very fussy about the nesting material in their nest. Australia already had built a beautiful nest using nesting material placed on their cage floor. But today he paced his cage and signaled to me that he wanted more material by grasping the bars of his cage in his beak. (Like most diamonds he does very well with his sign language). So I finally let him out of his cage and he walked over to my keyboard as if he wanted something. So since I had the scissors and a 3 x 5 card on the table I cut some strips off it. He happily came over, examined the strips closely, picked one up and flew back into his cage and up to his nest and gave it to his mate. He then came back and chose a few more pieces and made several trips up to his nest. Apparently he rejected the remaining strips and came over and started pecking the scissors and then looking me in the eye. It was obvious that he wanted more strips cut preferably ones that met his high standards. I got the impression he liked the thinnest strips that had a slight curl to them and he did not want any strips that had any moisture on them. He spent a considerable amount of time asking me to cut more and more strips, by pecking at the scissors each time he ran out of the "preferred" strips. We used to use pine straw, but we found the straw often had very small insects that seemed to remain even after washing so we discontinued that. So far we have had no "spraddle" legged birds. If we do have one we will reconsider going back to pine straw or using some thicker material that may be easier for the baby birds to grasp. Since my cages are too small for extended flying, I try to allow each pair of birds at least a few hours a week outside the cages. Most of the time they will walk around their table or will fly up to the roof of their cages where it is warm because of the lights inside the cages. Sooner or later they will fly occasional loops around the living room. Since they are normally ground feeders, I also allow them to fly down to the carpet to peck for spilled seeds. Droppings are usually dry, so they turn to dust that can easily be removed with a vacuum cleaner. They are not allowed on furniture, lampshades, or picture frames. Before allowing your birds out of their cage(s) be sure all windows are closed and covered with curtains or blinds, all mirrors are covered, all other pets are removed from the room, and all doors are closed. Beware that even though your other pets do not appear to pay attention to your birds, that the situation may well change once the other pets see them out of their cage(s). Of course your doves will enjoy the largest cage you can provide for them. If it is large enough they will not need any free flight time. Some people provide an entire room for the doves which eliminates many of the problems one has when you keep birds in your living area. But if you separate the birds from where you normally spend most of your time they may not make very good pets and will be difficult to handle. The same goes for outside flights and enclosures. They are much more suitable to those who are more interested in breeding birds than having them as pets. In general I recommend against keeping diamond doves with finches, canaries, or for that matter any other species unless you have a very large outside aviary with vegetation cover for privacy. While I have had little experience with such situations myself, I have received numerous messages from people that have had sad tales to tell about keeping other species with diamonds. The biggest complaint with finches and canaries is that they will pluck the feathers from diamonds to line their nests or sometimes just for fun. 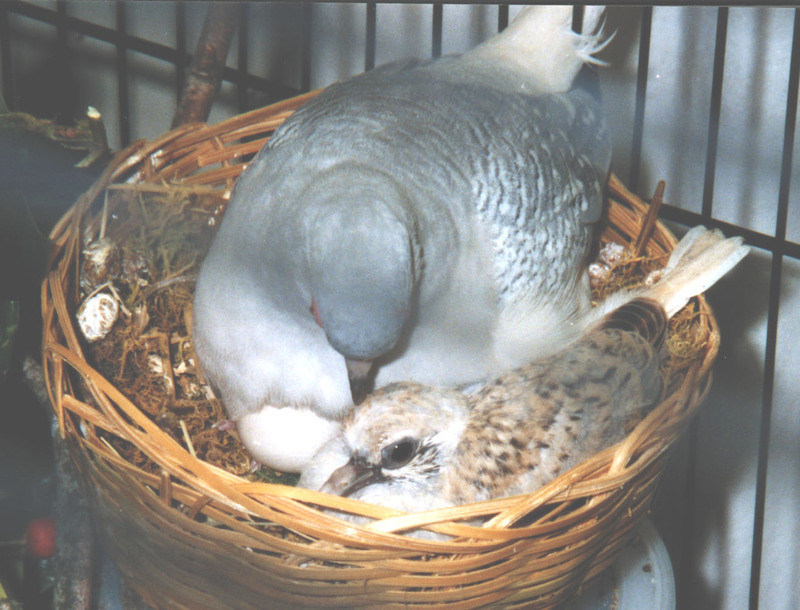 I have had several people write me that found bloody diamond doves in a pet stores that were in very bad condition because they were housed with finches. One person made the store owner give her a bird for free and she took it home and brought it back to good health after several months. My own feeling is that a diamond male and female should have their own private cage for maximum happiness. Diamonds do enjoy socializing with other diamonds and for that reason I keep a flock of several pairs and allow some out at the same time about once a week or more. Cages should be located in rooms that have south facing windows if that is possible. Rooms with southeast facing windows would be a second choice. North facing rooms should be avoided. The cages should be located in an area of human activity but not in a area that is subject to sudden movements and noise. If your cages are located in a dark area in your home or if the area becomes cool, you may want to add lights in each cage that is attached to a timer. I now have five lamps for my nine cages and I know the birds appreciate them. Your birds should receive a few hours of sunlight every day but their cage should be located to they can get out of the direct sun and into the shade if necessary. Your birds will probably lay down in the bottom of their cage and fan their wings and tail. If you can not provide sunlight, then should get full daylight spectrum light bulbs as a sunlight substitute. It should be noted that recent research has shown that even the above methods are inadequate for allow birds to synthesize Vitamin D3 which facilitates the absorption of calcium. If the birds are eating pellets rather than seed or have access to another source of Vitamin D3 the matter is not critical. However if they are eating seed they need access to unfiltered sun light. Full spectrum lights available today do not have sufficient strength to be useful for this purpose. Sunlight coming in through normal window glass has most of the ultra violet rays filtered out. Sun lamps provide ultra violet light at a high enough intensity but would damage the eyes without special glasses. The only alternatives I know are to obtain quartz window glass, windows made of certain clear plastics, or possibly use the new screens that only block out a minimum of light. Some people will take bird cages outside for an hour a day but that is a difficult chore and if the birds are left unattended a predator might find a way to hurt them. A warning against predators: I provide my doves with a platform in the east and west windows of my apartment at times of the year when sunlight is available. The east facing window has only regular window glass but the west facing window does have a screen. Each window has sunlight available for about 45 minutes each day. I do not depend on the window light for the synthesis of vitamin D3, but the doves obviously do like the opportunity to sit in the sun and look outside. However even such windows have their dangers. One day I was standing close to the birds at the west facing window and suddenly there was a very large bang and a huge shadow over the window. The birds went crazy flying up against the walls and ceiling, And then I could see that outside there was a huge hawk trying to penetrate the glass. Finally he gave up and retreated to the roof of the opposite apartment building. I rushed for the camera but he left before I could get a photo.. I think the hawk could have easily broken the screen. Fortunately that day the window with the screen was closed because the temperature was below 70 degrees, Thus the screen was not damaged because it was pressed flat against the window glass. If the glass has been open, I am sure the bird would have gone right through the screen. I have seen cats go through such a screen that probably weighed one third of the weight of this huge hawk. Thus if you have hawks in your area I would strongly advise against allowing your birds to sun themselves near a screened window or in their cage outside. And if you do allow your bird to be in a cage outside I would never leave it alone. I have one large wooden cage with a flood lamp in it that provides floor temperatures in excess of 110 degrees F (44 degrees C) which is normally far to hot for doves. However when I open my cages for free flight, many of the birds from the other cages will come in and take their turn laying under the lamp with one of their wings and tails fanned out. They do the same thing when I place them on a platform near a window exposed to the afternoon soon. Wild birds, especially pigeons, can be seen doing the same thing. Sunlight is needed to promote feather growth and to inhibit the growth of feather destroying bacteria. To prevent "night frights" and injuries, I feel it is absolutely necessary to provide a night light for your birds. Otherwise, since they have poor night vision, they will be frightened by every noise they hear and will thrash about and perhaps seriously injure themselves. You can use regular night lights or you can leave one 40 watt lamp on some distance from the cages. Cages should be located in a draft free area. You should watch out for drafts from fans, heating and cooling systems, and open windows. A healthy bird that is fluffed up on a warm day may not be sick, but is simply in the draft of an air conditioner duct. Diamond doves withstand a wide range of temperatures in their native environment but your birds living in a home environment will probably have much less tolerance to the temperature extremes found in the center of the Australian continent. I find that when the temperatures drop below 60 in my apartment in the winter, my diamonds will fluff and get as close to the lamps in their cages as they can. While diamond doves should be capable of withstanding the high temperatures that occur in the Australian outback, I have found that some of my birds will start to pant of the temperature reaches the low nineties. So if you have to expose your birds to such temperatures I would watch them carefully and if panting is observed take whatever measures necessary to reduce their body temperature. Dove cages should be located in areas that have a relative stress free environment Cages should not be located near doors to the outside that are frequently opened and closed nor should they be located near a loud TV or Stereo System that is on all the time. Other pets, such as cats, dogs, and snakes can also cause a high level of stress. However the cages should not be put in locations where there is little human activity, particularly if there is only a single bird being kept. Dust can be a health problem not only for the birds but for the inhabitant of the home or apartment where the birds are being kept. Frequent cleaning of the cages and the area around the cage is vitally necessary to keep the dust level down. Below is a list of other measures than can be taken. With all the movement of air that is needed to keep dust levels down, one must locate the cages in such a way that the doves will not be sitting in a constant draft or they will become sick. Many people complain that bird droppings destroy the stain finish on wooden furniture. I have a rocking chair and sofa with flat solid pine arm rest. Over the years I have re stained these arm rests a number of times. Finally I had 1/8 of an inch plastic sheets custom made for each of the arm rests, the two end tables and some of the book shelves. They can easily be cleaned with hot water and a soft paper towel. So far the plastic does not have any scratches in it and does not have a bad appearance. The American Dove Association recommends a mixture of 50% finch seed and 50% white millet. They will also benefit from a small pellet such as Purina's Small Bird Maintenance Diet. They also recommend treats including spray millet, corn bread, wheat bread, sweet potatoes, crumbled hard boiled eggs with shell, cottage cheese, shredded carrots, and chopped greens. At the present (2009) we use a wild finch seed which includes the components illustrated above. For treats we use wheat bread, ground up soup noodles, and shredded Mozzarella low fat cheese. We have found our diamonds will eat lettuce if cut into thin strips and preferably fed by hand. We have also fed them green peas by hand. They have shown little interest in chopped up egg whites and ground up egg shells. We also use liquid vitamins (Lambert Kay's Avitron) and some small amount of pellets. Calcium fortified grit that is provided in a regular seed cup. 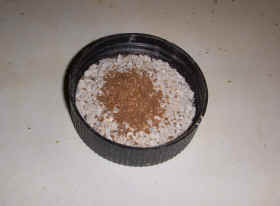 In addition we are now providing ground oyster shell and red livestock salt (for trace elements) (8). We would prefer to use crushed limestone instead of the oyster shell because the limestone has a higher calcium content and is reported to be preferred by many doves. A product known as Granular F is available in the mid west but so far I have not found a comparable product in Florida. We provide four pinches of oyster shell and one pinch of red of livestock salt in a treat cup (a large plastic bottle top) and change the mixture every one to three days. Unfortunately the red livestock salt is only available in 50 pound bags which cost around $8.00 per bag in 2010.. We took some plastic containers to the feed store, paid for a full bag, and took only about 15 pounds leaving the rest as I do not have storage space for larger amounts. The amount I did take home should last for several years with each cage only getting a pinch per day. The remaining information in this section is new on this web site. We do not have the proper references for this information but expect to in the near future. In the late 1990s, Dr .Laurie Hess of the Animal Medical Center of New York studied 135 caged pet birds and her data showed birds on seed diets are usually lacking in vitamin A, vitamin D3, calcium levels, and phosphorous. A high percentage of these birds also had the calcium/phosphorus ratio out of balance. A ratio (calcium to phosphorus) in excess of 2:1 will interfere with the absorption of calcium. A ratio of less than 2:1 will provide for a lower bone density. To obtain sufficient vitamin D3 which facilitates the absorption of calcium a bird needs to either received supplementary vitamin D3 or be exposed to about an hour of sunlight per day. As mentioned above in the Environmental Concerns section, adequate sunlight can not be obtained from full spectrum lamps or from sunlight through ordinary window glass. It must be obtained in the open, through quartz glass, or through certain clear plastics. The new screens may be a possibility as they pass more light than the old ones. If the birds can not be provided with direct sunlight, then supplementary vitamin D3 (liquid vitamins) can be used. The other alternative is through the use of pellet diets. Dr. Hess found that the only birds she studied that had an adequate calcium/phosphorus ratio were the ones that were being fed at least a diet of 75% pellets. I think the diet for cage birds comes down to these four alternatives. Despite previous advice it should be remembered no that full spectrum artificial light will not allow for the synthesis of vitamin D3. If you use less than 75% pellets then you must still use a reduced dosage of vitamins containing vitamin D3. Seed and other foods are those recommended by the American Dove Association state at the beginning of this section. Elderly doves often need special care. As birds age they often loose their ability to fly and they may develop weakness or paralysis in their legs. They may suffer from joint problems and arthritis. They may become blind from cataracts or other diseases of their eyes. Their beaks may develop abnormal growth patterns that require weekly trimming to allow them to eat. And their claws may grow excessively and require constant trimming. I have also run into other illness of old age like the development of non malignant tumors. And although I have not run into it yet birds can get cancer. Birds that can no longer fly or perch and also who have leg problems may soil themselves when they defecate and may need periodic bathing (and careful drying) - see below. Water, food, and grit can no longer be placed in cage seed cups but will require low containers like large plastic bottle tops like those found on peanut butter jars. They often need to be watched carefully less they fall in their water cup and become chilled and die. But if you find an old bird or even a baby that has fallen in water cup and has appears to be cold and dead, do not give up on him until you have attempted to bring his body temperature back to normal. Through experience I have found the best way to warm a bird is to immerse him in warm water (water that feels warm to your hands not hot) with only his head out until he shows signs of life. I would not remove him from the water until he has had the opportunity to become really warm. Then using a clean face cloth, paper towel, a lamp. and a hairdryer, carefully dry him off without allowing him to be chilled. This is a slow, time consuming process. Once completely dry he should be placed under a lamp to insure his body temperature is maintained for an hour or more. Most books indicate that diamonds only live for 10 to 12 years or so. Many of our diamonds died between 10 and 15 years and right now we have a pair of diamond (from our second generation) that are 20 years and 6 months old. The male's legs are paralyzed but he manages to shuffle around using his wings. However he still can fly. His mate flies and walks ok, but she has crossed beaks, is bald, and has a tumor under her wing which has to be periodically cut off. The male of our second oldest pair is about 18 years old and his mate was purchased in 1989 making her at least 16 years old. He no longer flies and his legs are very weak. He has a bad eye infection which requires constant treatment and likes to sleep except when he is eating. Currently all four birds are maintaining their body weight and show no signs of dying soon. The 18 year old male seems the worse as he always wants to sleep, but he too maintains his body weight. (7) Proctor and Lynch, Manual of Ornithology, Avian Structure and Function, New Haven and London, Yale University Press, 1993, pp 340.